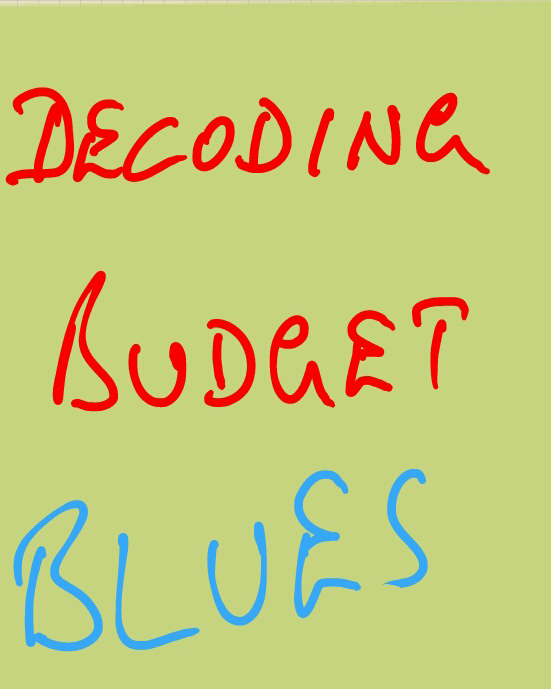 The first two parts of Understanding the Budget evoked good response. This post will dwell on the idea of Fiscal Deficit, a factor which is giving the Finance Minister of India the jitters. In the accompanying table, the Revised Estimates for 2012-13 show a Fiscal Deficit of Rs5,20,925 crore. In other words, what this figure means is that the Government of India is borrowing this huge amount of money in 2012-13! Yes, you got it right: a total borrowing of mind-numbing Rs5.2 lakh crore in one year! Now, go to the bottom of the table. It is mentioned that India’s GDP in 2012-13 will be Rs10028118 crore; yes, you read it right: Rs100 lakh crore! Taking India’s GDP to be Rs10028118 crore in 2012-13, the Fiscal Deficit of Rs5.2 lakh crore works out to 5.2% of GDP. So, to say that we are living way beyond our means would be an understatement. While Fiscal Deficit is bad, one that is high could spell doom for the economic growth of the country. The next post will focus on the adverse consequences of Fiscal Deficit. Let's take a break from serious Sunday Readings. You must have watched at least one TED video. In India, a lot of folks are holding their own desi versions of the TED series. I have found most TED talks uninteresting. And I found that I am not the only one who thinks like this! There are similar thinking guys at theOnion.com too! I stumbled on this Onion Talks spoof video series. Trust me this one is hilarious. Go ahead! 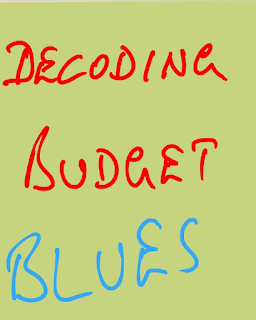 Two days back, I wrote the first part in the 'Understanding the Budget' Series under The Explainer Series. Take a look at the table graphic on the right. This document titled, Budget at a Glance, is the best document to understand the components of the various types of figures in the Budget. The Actuals for 2011-12 may be represented as such but they STILL would be PROVISIONAL only (see notes below the table in the above graphic). This means that these figures are NOT the final figures for 2011-12 but are subject to further revision. In fact, the final figures for 2011-12 will only be available toward the end of Financial Year 2013-14 (or Fiscal Year ’14). Budget Estimates (BE) relate to the figures which the Finance Minister set out in his Budget Speech last year (i.e., on 28 February 2013) for the Financial Year 2012-13. 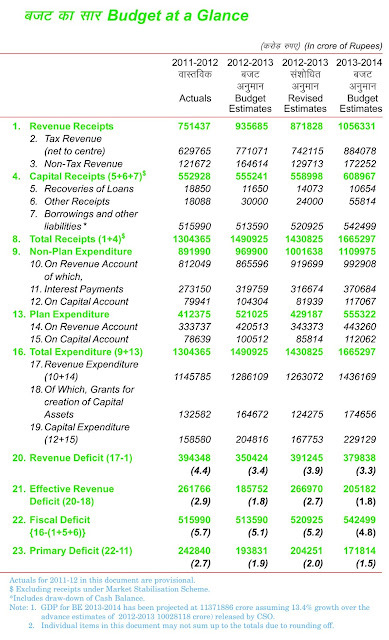 In the fourth and last column, you will find Budget Estimates for the coming Financial Year 2013-14. These figures reflect the various estimates made by the Government in terms of Receipts (including tax collections) and Expenditures (including interest payments and salary payments to government employees).